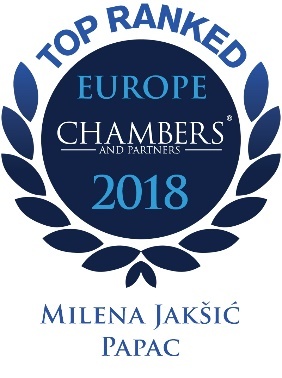 "Clients praise Milena Jakšić Papac for her 'reliable legal support, efficiency and diligent approach.' She routinely acts for multinational companies on employment matters such as contracts, dismissals and the secondment of Serbian employees abroad." Milena is a partner and the head of the Employment Practice Group. She advises on all aspects of employment and labour law, including the engagement and termination of employees, salaries and employment benefits, relationships with trade unions and negotiations of collective bargaining agreements. Her work includes providing daily employment advice and drafting employment related documents, advising clients on labour issues arising out of privatisations and mergers and acquisitions, and representing clients in labour disputes, redundancy proceedings and outsourcing arrangements. She also assists clients employing foreign workers in Serbia.